There are so many reasons to look forward to the holiday season. Perhaps it’s one of the only times you get to spend with loved ones, or maybe you’re looking forward to having time off work. And then – the holiday gatherings! With so many holiday goodies, it’s easy to forget those healthy eating habits. Here are some ways to make your Christmas a little more heart-healthy. With all the cookies, cakes, and treats available, sometimes we forget exactly what we’re eating and how much. Eating the right types of carbs is a great way of staying healthy during Christmas time. Whole grain products (like brown breads and pastas), root vegetables (like yams, sweet potatoes, beets, and carrots) and brown or wild rice are all great carbs to eat during the holiday season. You can instantly make your recipes more heart smart by using vegetable oils over butter and lard, without sacrificing the taste! Olive oil is great on potatoes, and even bread in place of butter. For baked goods, apple sauce can be a great substitute to baked goods, providing moistness and flavour. If a recipe calls for a cup of butter, replace with half a cup of apple sauce, and half a cup of butter. Delicious! Give a bit of crunch to your holiday recipes – try whole-wheat bread in your stuffing, or offering whole grain rolls as a side as your Christmas dinner. Those glazed hams can be really tasty, but aren’t always the healthiest choice. 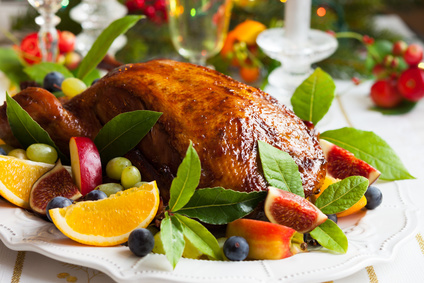 If possible, try to choose white meats over red and dark meats this Christmas. A little indulgence is fine – but knowing your healthy options can help you make smarter choices. Many store bought seasons contain a large amount of salt, so be careful. Additionally, canned or packaged goods can contain hidden salt, so check the label. Using herbs as seasonings can add a ton of flavour without all the added sodium. And remember, it’s okay to indulge a bit for the holidays. Just be mindful of what, and how much, you’re eating. Happy Holidays!